74-year-old James Harrison is a superhero to many he’s never met. 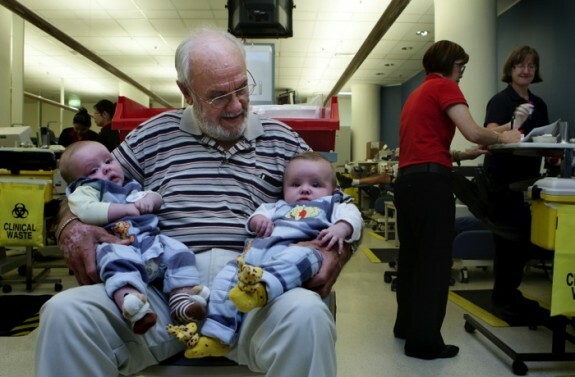 He doesn’t wear a cape or spin webs, but he has saved over two million babies’ lives in the past 54 years. James’ initial motivation for donating was a major chest surgery that he underwent at the age of 14, for which he needed 13 litres of blood. It was just after he started donating that the rare antibody was detected in his blood. Thousands of Australian babies were dying every year at the time of Rh disease. Some newborns suffered permanent brain damage. James’ blood became so valuable that his life was insured for AUS $1million. In 1966, he began to donate plasma. When the truth about his blood was discovered, he volunteered for a series of tests to help develop the Anti-D vaccine. The vaccine is given to all pregnant women who are Rh-negative. James’ own daughter, Tracey, has also benefitted from the Anti-D vaccine, shortly after the birth of her first son. She said that she was proud of her dad, especially because he continued to give blood even after the death of her mother. James and Barbara were married for 56 years. This is such a beautiful story. What a man. I finally got the guts to give blood; unfortunately, I have a heart condition that they aren’t willing to take a chance on, so, I cannot give blood. So I have so much joy for someone like this; so giving.